Charge Shot!!! 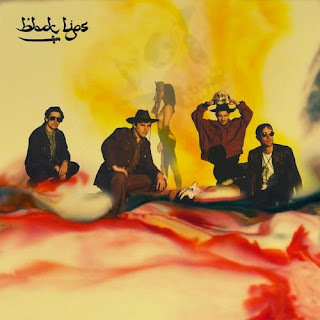 : Album Review: Black Lips - "Arabia Mountain"
Album Review: Black Lips - "Arabia Mountain"
"Dude, they are conjuring up those demons. Basically they're taking spells out of that book, or they're taking demons out of that book and working it into a song that basically conjures up these demons, man." This is a quote from what sounds like a found audio clip, spoken by a guy with a 1991 California accent. It comes in as the music fades on a song about Spider-man getting molested as a child. It's the third track on Arabia Mountain, the newest release from the blissfully sloppy, lo-fi, "flower" punk band Black Lips. Black Lips hail from Georgia, coming of age and popularity in the Atlanta scene that fostered bands like Deerhunter, Mastodon, The Coathangers, and King Khan and the Shrines. They're notorious to a certain extent. Their live shows have included vomit, blood, piss, etc. They are, as one of their earlier songs proclaims, Bad Kids. But their live shows are only an extension of the raucous, wild good time that is a Black Lips record. Arabia Mountain is no exception. And even though they collaborated with famed producer Mark Ronson the album is still uniquely Black Lips. In other words: It's still a slime-covered gem! This partnering with Ronson sent shockwaves through the core fanbase. Words like "toned down" and "cleaned up" were thrown around as the audience waited to see what these two very different musical entities would come up with. Even the Lips themselves seemed a bit shocked that they were able to land Ronson for the job. The band had never before recorded with a producer, but for this, their seventh album, they decided to give it a shot. As lead guitarist Ian Saint Pé explained in a minidoc about the union of Ronson and Black Lips, "When we were thinking about people we wanted to work with, that Amy Winehouse record sounded really dope, that was Mark Ronson. So we put some feelers out and Mark Ronson was totally down." The album itself is complicated. It is a lot of things. It can be bright, it can be brash, it can be haunting and nasty and dirty. Most of all it is exciting. Every song is so different from the ones around it. But at the same time every song has that unmistakable Black Lips scruff to it, that ring-of-dirt-around-the-collar feel. The songs are quick and pounding, with only two of the sixteen songs clocking in over three minutes long. The instrumentation on the album features everything from hand-claps to Theremin. The opening track, "Family Tree," slides open with a saxophone (an instrument they've barely used in the past). But when the song gears up the sax gives the whole song a sort of slimy feel. It shouldn't work, but it does. You really get the feeling the every instrument is being used to its full potential (toward the end of the song the saxophone devolves into a noise solo reminiscent of James Chance). The singles released so far are "Go Out and Get It" (video above), "New Direction," and "Modern Art" (video below). "Go Out and Get It" is a pumping summer fun anthem. It begs the listener to just go grab what they want from life. From a band as wild and (seemingly) free as Black Lips, this advice comes off as heartfelt, not cliché. "New Direction" is a jangling song about "going on a vision quest." We get snippets of a psychotropic experience through lyrics like "I want to laugh and I want to cry,/I want to spit but my mouth's too dry/I wanna run but I can't because my legs won't go/where did they go?" And then there's "Modern Art" which starts off with the lyrics "K-Hole at the Dalí/seeing the unknown/well it might have been a molly/'cause my mind's being blown." Black Lips have never been shy about their use and abuse of drugs. It is, for better or worse, a part of the American Experience. And if these southern sloppy kids are anything, they're experienced Americans. These are three fun songs, but the real standouts in the album are "Don't Mess Up My Baby," a gang-vocal warning against overstaying one's welcome (and using up all the drugs). It suggests that the subject of the song "settle down and have some children 'cause your brain is fried." The earlier mentioned song about Peter Parker's childhood molestation, "Spidey's Curse," paints a dark and inventive picture of the web slinger. "Peter Parker's life is so much darker than the book I read," croons guitarist and singer Cole Alexander. It's messed up and inventive. It works. Finally, I have to mention the track "Mr. Driver." I've been obsessed with this track (as I have want to do). It's been on repeat in my house for days. It will soon overtake "I'm Just Beginning to Live" as my Most Listened to Song on iTunes. There's something about it that just feels hopeless and strange, with lyrics that scream and plead "I want to BLEED on my Squire." Give it a listen. Tell me what you think. I don't have words to express the way I feel about it, but I feel very strongly about it. Arabia Mountain delivered everything I wanted from a Black Lips album. Snotty youth, brash musicality, inventiveness, experimentation, drug culture and the absurd. If you can get into it, you'll get way into it. I'm sure of it.